U.S. Secretary of State John Kerry, left, addresses Cambodian Prime Minister Hun Sen at the outset of a bilateral meeting at the Peace Palace in Phnom Penh, Cambodia, Jan. 26, 2016. Human rights concerns and bilateral trade have been focal points for U.S. Secretary of State John Kerry, who held a series of meetings with officials in Cambodia Tuesday. Kerry said progress for Cambodia in the areas of human rights, universal freedoms and good governance is “critical” in order “to fulfill the potential” of bilateral relations with the U.S. He commented to reporters in a lush outdoor courtyard after holding separate talks with officials, including Prime Minister Hun Sen and Cambodian acting opposition party leader Kem Sokha. “Democratic governments have a responsibility to ensure that all elected representatives are free to perform their responsibilities without fear of attack or arrest,” said Kerry, who emphasized that he raised human rights concerns during his talks with officials. U.S. Secretary of State John Kerry, left, shakes hands with Cambodian Foreign Minister and Deputy Prime Minister Hor Namhong before a bilateral meeting at the Ministry of Foreign Affairs in Phnom Penh, Cambodia, Jan. 26, 2016. There is ongoing concern about Cambodia's efforts to ensure democratic and human rights reforms. With opposition leader Sam Rainsy in self-imposed exile to avoid what is widely considered to be politically motivated charges, and 17 opposition members and activists in prison, rights groups say any improved diplomatic ties must be accompanied with Cambodian guarantees for reform. Kerry also praised Cambodia for its economic progress. 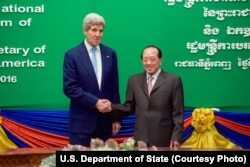 "Cambodia has experienced remarkable growth," said Kerry to the prime minister as they headed into talks. "You have seen incredible changes, not just here in Phnom Penh, which moved from a 350,000 person war-torn city to a much more modern city of 2.2 million people." 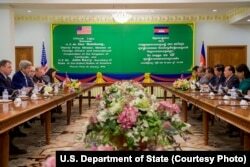 Hun Sen told Kerry that he considers next month's U.S.-hosted special ASEAN (Association of Southeast Asian Nations) summit a "step forward for the strategic partnership" between the U.S. and ASEAN countries. U.S. Secretary of State John Kerry addresses Cambodian Foreign Minister and Deputy Prime Minister Hor Namhong at the outset of a bilateral meeting at the Ministry of Foreign Affairs in Phnom Penh, Cambodia, Jan. 26, 2016. One of the focal points during the summit, in California, will be addressing the “urgent challenge” of countering violent extremism, said Kerry. He added that Prime Minister Hun expressed an interest in working with the anti-Islamic State group coalition. Cambodia is the second leg of Kerry’s swing through Asia, which also included a stop in Laos. From Cambodia, Kerry travels to China where he will press Beijing to use its leverage to exert pressure on North Korea for what it said was a successful nuclear test. He is also expected to raise U.S. concerns about the ongoing maritime disputes in the South China Sea. Earlier Tuesday, Kerry visited the National Museum of Cambodia, home to one of the world's most extensive collections of Khmer cultural material.